This is another famous model designed by Mrs. Maria Sinayskaya. 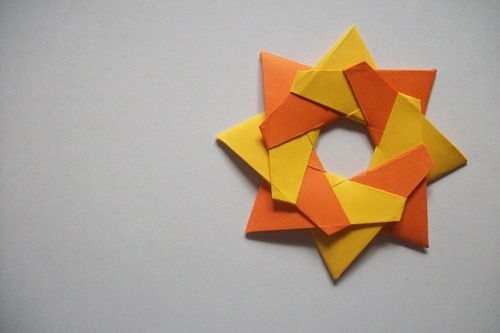 If you are experienced in origami, this is a piece of cake. Plus, it only needs 8 units. This is A LOT simpler than that “Spring Into Action” model. (once again, no offense Mr. Beynon). Just look at it. It looks like a flower which was shot by a giant caliber bullet or something in the middle………so cute. It’s also really sturdy……it’s not the type of origami which would just explode violently when brought anywhere. I once made a different star from another designer (I will not state his or her name). The star was actually beautiful. But apparently, like the poor trashy origami it is, the last time I saw it, the units were everywhere, as if a bloody origami murder had taken place. What do it think it is? A bomb? Fooh! UPDATE: Mrs. Sinayskaya just released the diagrams for her "Robin Star ver. 2" on her blog.